Can Research and Development Fuel the Canadian Economy? Can Innovative Research and Development Boost Canada’s Economy? HomeBlogMarket TrendsCan Innovative Research and Development Boost Canada’s Economy? Can industry-led research and development help Canada transition to a knowledge-based economy? The Government of Canada thinks so, and has been calling on businesses across the country to become more innovative by all means possible. Since the Liberal government took power in Canada, there has been a stark contrast in the way economic development has been approached. While the previous government may have been more focused on capital investment as a means to become more competitive on a global stage, the Liberal party has focused much more on R&D activities. Government research grants are being used to incentivize businesses performing R&D internally and through qualified post-secondary research institutions. Both options have a range of benefits, although both have unique drawbacks that could hinder the success of projects. Ultimately, businesses must consider how they are planning to commercialize the innovation, as it may play a substantial role in how research is performed. There have been significant efforts by the Liberal government to instate a ‘knowledge-based economy’, however the term (as they use it) is still widely misunderstood. First and foremost, it’s important to learn why innovation is a hot topic among governments and businesses around the world. On a macro level, global issues such as climate change, rising populations, and access to clean air and water are prevalent around the world. Technological advancements have the power to lessen or eliminate these problems, and the country bringing these solutions to market will be able to generate wealth at an accelerated pace. On a micro level, innovation can have many benefits throughout the Canadian economy. Even simple technological advancements can provide organizations and the people running them with the competitive advantages needed to succeed. These small but powerful innovations have the ability to fuel entire supply chains and industries within a country. When amplified over several years or even decades, this level of innovation has the ability to make even basic economies into global leaders. Related Blog: How Can Canadian Businesses Innovate on a Global Scale? Canada is not alone in its push for greater innovation. Countries including the United Kingdom, Australia, and China have all made public calls for more innovative research and development. It’s important for all of these nations to remain competitive in this aspect, since innovation often brings investment, jobs, and new opportunities to the country. The Global Innovation Index (GII) clearly identifies how effectively governments are supporting innovation. Since innovation can be difficult to define in one metric, the Global Innovation Index measures countries on a series of metrics such as the country’s quality of education, patent laws, and the ease of obtaining credit. The 2016 Index ranks Canada with a score of 54.7 (out of 128), or 15th globally, which isn’t bad but leaves much to be desired. For comparison, last year’s data placed Canadian innovation with a score of 55.7 (out of 128), or 16th globally. When compared to other nations, Canada is gaining ground but ultimately became less innovative over the last year. Among the reasons for a lower rating, Canada’s institutions, infrastructure, business sophistication, knowledge & technology outputs, and creative outputs have become weaker. Two areas where Canada has excelled over the last year include our educational system and increasing human capital. If there was a strong correlation between R&D investment and profit, companies would invest all of their working capital in the activity. The reality is businesses are much more hesitant to invest in research and development because of the uncertainty involved. If there is a chance research projects won’t result in a positive ROI, the project generally isn’t carried out. There are two general ways that businesses approach research and development in Canada: internally and through research institutions. When conducting research projects internally, your organization controls the entire process from start to finish. From initial planning, to conducting exploratory research, to formulating a final report of findings, your organization is required to do it all. Benefits: Easy to control the direction and focus of research projects; maintains intellectual property (IP). Drawbacks: Time and labour intensive; difficult to maintain team of R&D specialists to perform tasks. Organizations lacking the internal materials, equipment, or expertise required to complete research and development projects may choose to access a qualified research institution. Research institutions are commonly affiliated with a post-secondary institution, such as a college or university, and can provide the space and resources necessary to complete R&D activities. Benefits: Access to a team of researchers, equipment, and materials. Drawbacks: Project scope may creep with an external team; may need to share intellectual property (IP) with the institution. Performing research at post-secondary institutions is becoming more common among Canadian small and mid-sized businesses. Companies who lack the internal systems and processes to perform R&D projects may access state-of-the-art systems at institutions across the country to develop innovative solutions. Businesses should be aware of the differences between research institutions before choosing one for their project. Canada’s many research institutions all have areas of specialization, however another consideration organizations must make is whether to access a college or university-based research institution. Canadian colleges are excellent partners for businesses conducting applied research and development projects. Companies often use colleges to research practical, ready-to-implement solutions aimed at speeding up production or reducing expenses. 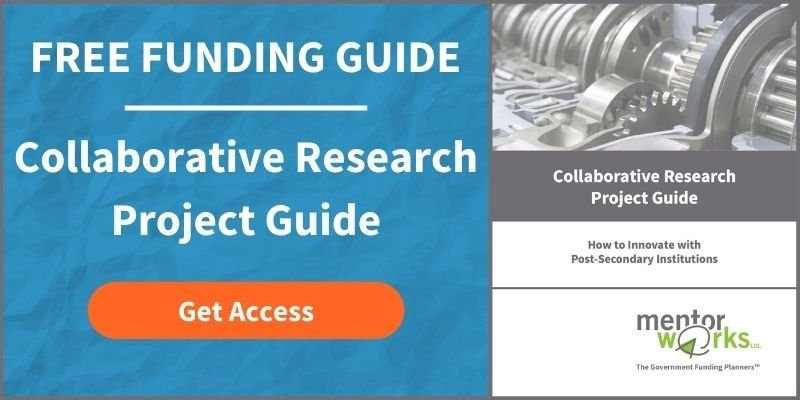 College-based R&D projects typically focus on the commercialization of products or processes and seek to provide immediately-actionable insights. For example, an automotive parts manufacturer is researching composite materials to use for a new product. The manufacturer may use a Canadian college to test various materials and ensure the chosen material is durable enough and performs as required. Alternately, Canadian universities are excellent partners for businesses conducting advanced research and development projects. Companies on the forefront of innovative research may choose universities to access talented teams and computing systems to theorize solutions. Often times, businesses conduct university research as part of a larger project, and the data or findings provide insight that the company may choose to act on. Consider the former example of an automotive parts manufacturer who is researching composite materials. The company would be able to access university researchers for work including the development of new material compounds and advanced computer modelling/simulations of product performance. The Government of Canada’s push for greater innovation has meant continued support for many popular research grants. While some programs require businesses to partner with qualified university research institutions, all funding opportunities assist companies to bring new products or processes to market at an increased rate. Businesses may access university researchers to address specific innovation challenges. NSERC multiple programs to connect organizations to researchers, including NSERC Engage grants providing up to $25,000 in funding. NSERC Engage projects generally last up to 6 months. Upon completion of NSERC Engage, companies may extend their research project funding for another 1-5 years with NSERC Collaborative Research and Development (CRD). NSERC CRD may award companies up to $200,000 per year to collaborate with academic researchers and develop new products or processes. Mitacs is a national not-for-profit organization that promotes the collaboration of businesses, federal and provincial governments, and post-secondary institutions. One of the way Mitacs does this is by administering research grants directed towards businesses who host research interns. Mitacs Elevate helps connect businesses with PhD students for long-term research projects lasting 2 years or more. The program provides grants worth up to $25,000 per year to reduce the researcher’s salary. Alternately, Mitacs Accelerate connects businesses with a team of university researchers at reduced cost. Accelerate research grants support companies hosting a researcher for at least 4 months at a time, and internships can be extended if additional research expertise is needed. The R&D Project Hiring Grants Internship Program enables employers to hire college or university research interns. Employers receive up to 6 internship units per application, and each internship represents a 4-month funding period. Employers may hire up to 6 research interns for 4 months, or may hire fewer researchers to work consecutive internship units. Similarly, the R&D Project Hiring Grants Fellowship Program provides funding to hire a PhD graduate or post-doctoral fellow. Employers may receive up to 2 internship units per application, with each internship lasting up to 12 months. Companies may use these internship units to hire two researchers for 12 months, or one researcher may be hired for up to two years.